Most adults tend to swim at the Council pool closest to home, and that's a sensible thing. But, after having kids, many of us find ourselves driving all over town in search of the pool that's going to work best for our children at a particular age -- whether they're babies, toddlers, pre-schoolers or older. Yeronga Pool has a (very) heated teaching pool for babies and toddlers (used for lessons only), a (slightly less) heated 25m pool (open to the public when there aren't lessons on), and a 50m lap pool. It also has a 'mushroom' pool, which is a great depth for young kids and features mushrooms that rain water and jets that fire sprays in all directions. Yeronga is the most attractive pool I've been to, with Balinese huts and open-air decks, and a good coffee shop that sells decent meals. It also has a trampoline for free use (parents must supervise), a kids' club child-minding service, and a big park next door that has a good playground. I spent a lot of time at Yeronga when my sons were small, and held one very successful birthday party there (you can book spaces, barbecues or even one of the pools for parties). Newmarket Pool is perfect for kids from toddler age upwards. Its point of difference is a toddler's pool that features two toddler-scale water slides. You can stand in knee-depth water and watch your child walk up a short flight of steps, get into one of the enclosed tubes, and whoosh safely down to you. In addition, Newmarket has a larger slide on one side of the 50m pool, which is good for older kids. The large pool sometimes also features a floating jumpy castle. You can hire inner tubes, use a barbecue or playground, or buy the usual pool food from the kiosk. There's also a heated teaching pool that's open to the public when lessons finish. Chermside is the next level up from Newmarket -- a water-slide park that isn't as wild as the Gold Coast operations, but still gives my boys (aged 8 and 10) a thrill. And it's a lot closer and cheaper than the coast. 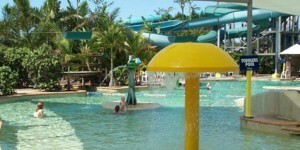 As well as a standard lap pool and toddler pool, Chermside features a number of water slides that open only for the summer season. These include an inner-tube ride, an enclosed water slide, an open water slide and two drop slides. My husband and kids love it, and I find enough to do to enjoy myself (I'm not a big fan of high-speed slides). You can book birthday parties here, and they have a cafe selling typical takeaway food. A day pass for a family of four costs $30. If you're looking for something free and central, there's always the South Bank swimming lagoons. Some people I know also like Musgrave Park Swimming Pool in South Brisbane, which has two square wading pools, big grassy lawns, and views of the city's skyscrapers. But what about you? Where's your favourite pool for kids? Share your suburban secrets and help other parents splash out with their kids this summer. These pools all sound great. We usually take the kids to Hibiscus at Mount Gravatt but will definately try some of these over the summer. Bundamba Pool at Ipswich has a nice new kids pool with a mini slide, water curtains etc. They also have a heated pool for the learners and a 50m pool. I think the lagoon at Redcliffe is ideal, especially for young kids. There is a separate paddle pool (and a playground) for the littlies and the huge lagoon has both shallow and deep areas. There are lifeguards in the summer and best of all - it is all free. A great day out for the whole family. I agree -Yeronga is an excellent pool, and really great for mother's groups too. 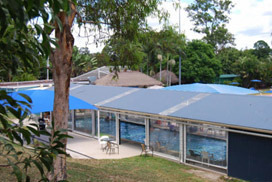 Yeronga used to do fantastic mums & bubs aquarobics classes, but has recently stopped, and now it's Ithaca Pool (on Caxton St opposite Suncorp Stadium) that does the aquarobics classes, and you can even leave your kiddies in the creche for a small fee extra..
A class designed for busy mums. 1hr fitness session while your kids are taken care of in our supervised creche. Newmarket or Sandgate gets my vote, especially with younger kids. We don't get the value for money out of Chermside with kids under 8. All the council pools have advantages and disadvantage. Some have heated pools (many), some have only cold showers (Hibiscus Gardens) , some have a lovely heated pool but it is only open on weekdays (Clem Jones Centre). This weekend I decided to go to a council pool so consulted Weekend Notes (and Google) for some idea's. I decided on Langlands Pool at Stones Corner. I used to go to this pool 45 years ago when I was a child and loved it. Well, it was wonderful. It cost $4.90 to get in for an adult, it has a big pool and heated undercover pool and wading pool. It also has some great undercover seating and eating area's all set up under separate covers. You don't get the impression that its crowded because of the many many tables and chairs available. We were able to take along a flask of tea, a few breadrolls, a few cans of drink and we were set for the day. We took along a good book an spent our day alternating reading, swimming, floating in the heated pool and having a bite to eat. The ONLY downfall was the fact that you can only park in the surrounding streets for 3 hours from 7am - 7pm due to the fact that it is behind the new Langlands Busway station. This must be annoying at the weekend when families want to go to the pool, but I guess great if you wanted to get the bus there. This summer I took my three children (12yo, 11yo and 2yo) to a number of local pools. 1) Chermside - this had a great selection of slides and activities to keep all three entertained for over 3 hours. The toddler section had a baby slide and three toddler slides, mushrooms and plenty of water space to play in. There were two bigger slides for the older kids to play on as well as the diving or jumping stand, two drop slides and an obstacle course across the pool. Food choices were limited especially since it was a weekday that we went. 2) Albany Creek Leisure Centre - this had a great undercover baby area with sprouts and mushrooms and no pools of water. There is also a toddler area with a slide, more mushrooms and a spa bath. For the older kids, there is a slide and lazy river. The only downside, was again the lack of food choices especially since we went on a Monday. 3) Sleemans Centre (Chandler) - This had three pools, including the diving platform and one heated pool. A Slide as well as a toddler area. Food selection was good here on the both days we went. All three places are well worth a visit but suggest taking food and drinks to both Albany Creek and Chermside.